You are here: Home / Accessories and Devices / Devices / Android vs. iPad: What platform will be the long-term winner? See, I am a big advocate of integrating tablets with traditional computers, which gives me a somewhat different perspective on the iPad vs. Android debate: Hardware specs are less important than you think – its the ecosystem that is all important! 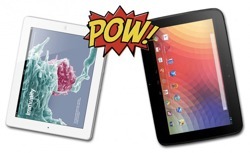 How do iPad and Android fit into your computing ecosystem? In my opinion, one of the most important things in understanding tablet computers is that the tablet is not meant to replace your laptop or desktop computer. At least for knowledge athletes like you. My mom’s next (and only) computer will be a tablet, but I am sure I will continue to use both laptop and tablet computer throughout my working life. My iPad and my Mac excel in different things: I can annotate papers and design presentations on both devices, but I prefer to do the former on my iPad and the latter on my MacBook. The most important question, thus, is not whether a tablet replaces pen & paper or your laptop, but how you can integrate a tablet with all your other digital and analogue devices in a seamless workflow. From such an ecosystem perspective, I couldn’t care less that the Google Nexus 10 or any other Android tablet (momentarily?) outshines the iPad in terms of hardware specs and price. What company will offer the better hardware will probably change back and forth over time (based on what company updated its lineup last). I also don’t see any reasons to always upgrade to the latest model – I am still rocking my first-gen iPad! Given my slow update cycle, I also don’t care much about paying the “Apple tax”. The longevity of my iPad and the ecosystem benefits are return enough for me to justify the higher price tag. Google’s Nexus 10 Android tablet outperforms the iPad 4 in many hardware aspects, including screen resolution, at a cheaper price. But apps and the overall ecosystem are more important than hardware specs! What ecosystem has the best long-term advantage? When deciding between Android and iPad, the situation is relatively simple when its only about your own purchase decision. Forget about minor differences in specs and price, and just get the top of the line tablet in the ecosystem that is most closely integrated with your other computers. If you are a Mac user, I am pretty sure that this is the iPad. Things are a little more complicated when you are in charge of outfitting your school with a tablet program, or when you are willing and able to build your own workflow from scratch (e.g., you can go either Mac or PC). But again, it is a matter of picking the best ecosystem. Minor differences in specs and price don’t matter, because the highest costs in choosing a tablet lie in the time you invest to incorporate it into your own and other peoples’ workflows. When choosing an ecosystem from scratch – either for yourself or for your school – another important question must be asked: What eco-system is most likely to produce high quality tablet apps (now and in future) that will assist you in research, teaching and learning? Great apps are not only a result of great ideas, but also of developers’ commitment to invest significant resources into the development process. It sounds very simple, but at the core, you and I enjoy great apps (on the iPad and Android tablets!) because developers decided to support its platform. When trying to forecast what ecosystem will have the best user experience over the next years to come, it is therefore important to look into developer loyalty. Flurry is a service that tracks a massive amount of data to do exactly that. In a report from June 2012, it found that seven out of ten new project are started for iOS. That number includes both phones and tablets apps, but since Apple already has a higher amount of apps specifically designed for iPad, it is safe to assume that, at least over the next few years, the iPad will probably stay a few steps ahead of the Nexus and other Android tablets in terms of high quality tablet apps. There are multiple reasons for the higher return on investment in the iOS ecosystem, and a big one is the prevalent fragmentation within the Android world. Many Android devices still run an OS that is three to four generations old, thus limiting the base of devices that can take advantage of more advanced features in apps. Worse yet, Android devices often have different screen resolution and sizes that make developing apps for Android more complicated than developing iOS apps. The Apple world has recently become a little more fragmented as well, mostly due to the new screen size of the iPhone 5 and, to a lesser extent, due to the higher resolution of the 3rd and 4th generation iPads. However, iOS apps can be relatively easily scaled between different devices. Even the 7.9 inch iPad mini can comfortably run the same iPad apps that are developed for the original 9.7 inch screen. 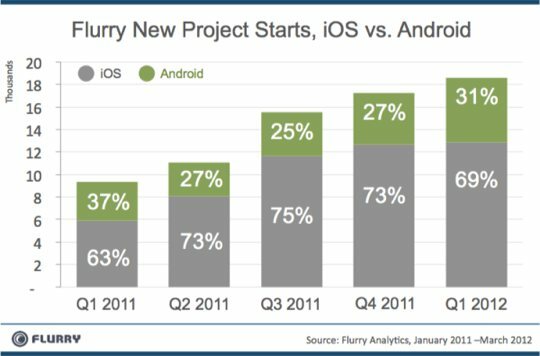 Flurry’s data then suggest that many developers will continue to focus their resources on Apple’s ecosystem, thereby helping Apple to defend its first-mover advantage against Android: Many high quality tablet apps will arrive first (and often exclusively) on the iPad. In other words: the fact that Android tablets are closing in on the iPad in terms of hardware specs does not mean that Apple has lost its allure for academic users. No doubt, Android tablets (and maybe Windows tablets) will continue to gain market share, and lots of users will find that the Nexus offers a good value and tablet experience. And if this experience results from a close integration of the Nexus with the rest of their computer ecosystem, then this is a great thing! But don’t worry about minor hardware differences between the iPad and Android tablets like the Nexus! For power users, the ability to integrate tablets with the rest of their computing ecosystem and the long-term availability of high quality tablet apps are more important than minor differences in hardware. Given the data from Flurry, it seems like Apple will continue to attract talented developers to focus their energy on producing great iPad apps. For this reason, I am feeling comfortable with my (money and time) investment into Apple – but of course, this is only my biased opinion. Disclaimer: Images from gizmag, gadget review and Flurry. Please consider sharing this article if you found it useful. Most of the people I know personally buy products and have no idea what they can do or what the specs are or even mean. They buy it because there friends have it and told them how cool the product is even tho most will just use it for Facebook and play candy crush saga. 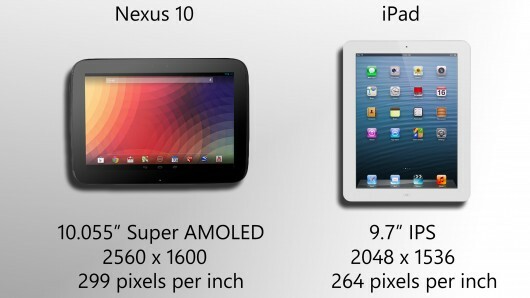 Benedict Evans, analyst, did some number crunching on the Nexus 10 sales. His conclusion: Nexus isn’t an iPad killer, with 600.000 to 1 million Nexus 10 in use (total). “That compares with probably 10m iPad Minis sold in the last 2 months of Q4, and 36.9m iPads sold in the second half of 2012. There are a lot of china-tablets now with a 4:3 ratio, competetive hardware-specs, and a recent version of android, in a short period of time there will even be devices with retina-displays. The biggest points are the individual workflow and ecosystem and the “peripheral question”: in terms of finding keyboard-folios or cases for your tablet the iPad offers a much bigger choice and price-span. That Problem even gets bigger if you are in search for a qwertz-layout (as I, as a German,do so) – only the more expensive products make their way into the European markets. Because of that problems with apps and peripherals (with main stress on the latter) I still would not think about flipping over into the ios-world: I have established a gtd-inspired selfmanagement via gmail and it would really be a pain if I had to give up widgets, as they can make your homescreen a productive command-center – the homescreen of the iPad doesn’t – an android-user would call it “app-drawer”. I like the customizability of android. The only thing that’s missing is a office-suite that meets the requirements of academic writing. In my case and my point of view, an alternative to my galaxy tab 2 10.1 would rather be a windows-tablet, especially in terms of office-support (as I am a heavy user of onenote). Tehre are no apps Windows 8 and RT that allow PDF reading and annotating (not only for reading text-pdfs, but also scanned texts). I totally share your opinion about the iOS home screen. It was made for a time when you only had the couple of stock apps provided by Apple, which all kind of fitted on one page. Then the App Store opened up, and now the old “app-drawer” concept is stretched to its limits, even over-stretched. I hope that Johny Ive gobbles up that old interface when he puts his mark on iOS 7. I think in education, the iPad is starting to emerge as the winner. When we talk about tablet roll-out programmes its always the iPad, or Android. there are just no android tablets which fire the imagination as the Apple product does. When someone asks you which tablet you have, they wont recognise most of the Android products, but will instantly know what the iPad looks like and does. Its not just the tablet either. Its the amazing education resources on offer from Apple. Just look at ITunesU and iLife…amazing resources for creativity which are just not there on other platforms. This will need to be addressed by Android if its to have any chance of overhauling the iPad. Education is a major driver of demand. Quite frankly, the kids influence parental choice and purchase like never before! In other words: Apple users are growing faster and are more valuable for developers. Really good points as well, Bryan. I think the support functions really critical for people in order to fully unlock the potential of their devices. After all,that’s one reason why I founded academiPad. Also, the peripheral thought is an important one. I have some posts here on academipad how external keyboards can turn iPad into a killer writing machine, but one really needs a good keyboard. Luckily, the iOS accessory ecosystem is as vibrant as the app ecosystem (which can be also explained by Apple devices being more plentiful and more similar in size, and Apple user being more likely of paying for accessories). It’s worth remembering that the iPad has a 4:3 ratio that is more suited to reading PDFs than the 16:10 screen on the Nexus 10 and most high end Android tablets. This will likely change in future, but for me it means that the iPad hardware still wins out, regardless of raw specs. That’s a good point to consider, as well.